With 15 years of dedication as a Major League Baseball Umpire, Steve Palermo was ranked as the number one umpire in the American League in 1991 by Sporting News­ for his overall performance. Prior to joining the MLB Umpire Development Program in 1972, Palermo studied education at Norwich University, Leicester Junior College, and Worcester State College from 1967-1971. Palermo’s umpiring career began in the Minor Leagues, where he only spent five seasons before making his MLB debut in 1977 in the American League. His highlights include the 1983 World Series, four AL Championship Series (’80, ’82, ’84, ’89), and the 1986 All-Star Game. 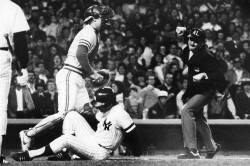 Palermo was the home plate umpire on July 4, 1983, when New York Yankees pitcher Dave Righetti threw a no hitter, and was the third base umpire in 1978 when the Yankees faced the Red Sox in a one-game playoff at Fenway Park to determine the Eastern Division champion. On July 7, 1991, Palermo and a couple friends were dining after a Texas Rangers game. During their meal, two waitresses were robbed in the parking lot. In an effort to apprehend the assailants themselves, Palermo suffered a bullet wound to his spinal cord, resulting in instant paralysis from the waist down. He was told he would never walk again and his umpiring career was over. With overwhelming support, and immense fortitude and devotion to his rehabilitation, Palermo defied the odds against him and is walking again. Palermo began The Steve Palermo Foundation for Spinal Cord Injuries in 1992; a family foundation to fund research to discover a cure for paralysis. Residing in Kansas, the Palermo’s also formed a partnership with the University of Kansas Endowment Association, and The Steve Palermo Nerve Regeneration Laboratory now resides in the Life Sciences Innovation Center at KU Medical Center. In 1994, Palermo received the Arthur Ashe Courage Award from ESPN. One of the most prestigious awards in sports, the recipient possesses strength in the face of adversity, courage in the face of peril, and the willingness to stand up for their beliefs no matter what the cost. Prior to accepting his current role as Supervisor of MLB Umpires in 2000, Palermo served as the Special Assistant to MLB Commissioner (1994-1999), and as a Color TV analyst for the New York Yankees (1996-1997). Palermo was the Honorary Commissioner during the White House Tee Ball Game on South Lawn in 2005, which marked the 15th anniversary of The Americans with Disabilities Act. Currently the Honorary Chairman of the Mid-America Games, Palermo also is a motivational speaker. He expresses inspiration, resilience, and motivation, and how the perseverance of his medical challenges compares to the perseverance of reaching the big leagues.